Baked Potatoes are pretty high up there when it comes to the ultimate comfort foods. They're also very synonymous of cheap student dinners, stuffed with gooey, disgusting, processed ingredients that take you that little bit closer to your coronary arteries exploding. I do love them though, almost as much as I am really, really trying so hard to eat healthy at the moment. 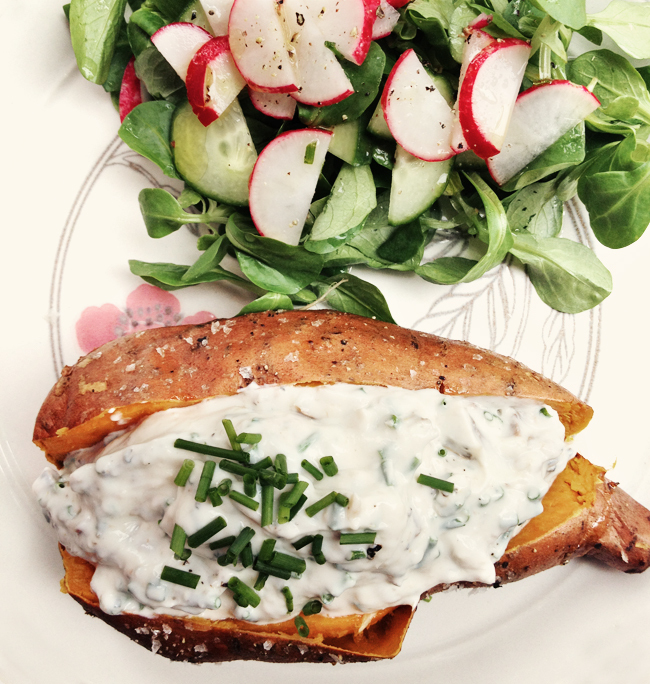 So here is where the sweet potato comes in and the greek yoghurt and the smoked mackerel and a luurvly side salad. Guys, this dish might sound odd but seriously, it's such a treat for your taste buds. You've gotta try it! Pre-heat your oven to 180˚C. 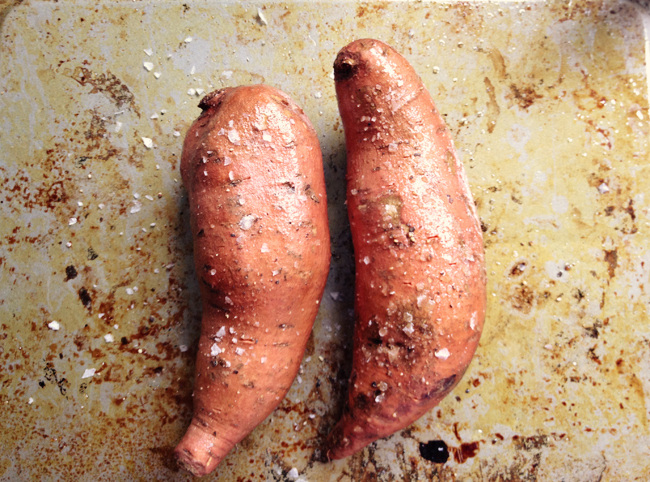 Wash the sweet potatoes and place on a baking tray. Slightly prick with a knife all over. Drizzle with plenty of olive oil and season with salt and pepper. Make sure your potatoes are well coated in the oil on all sides. Place in the oven and bake for half an hour or until soft and cooked through. 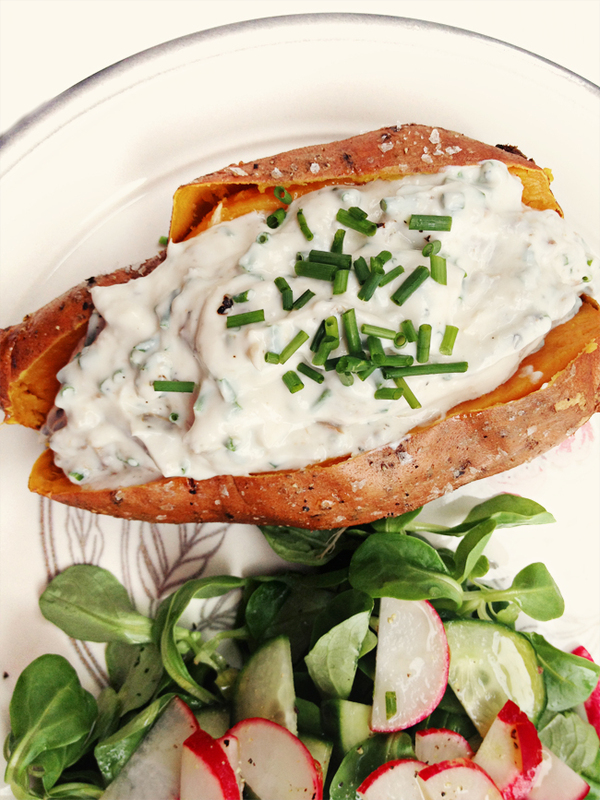 Spoon the greek yoghurt into a large bowl and mix with the horseradish. Add the mackerel and 2/3 of the chives. Combine well until all ingredients are well mixed. Season to taste with salt and pepper. For the salad, put the olive oil, honey and lemon juice alongside a little salt and pepper into a small jar. Close the lid and shake until the dressing resembles a smooth emulsion. Drizzle over the salad ingredients. Once the potatoes are cooked, cut in half stopping approximately 3/4 way down. 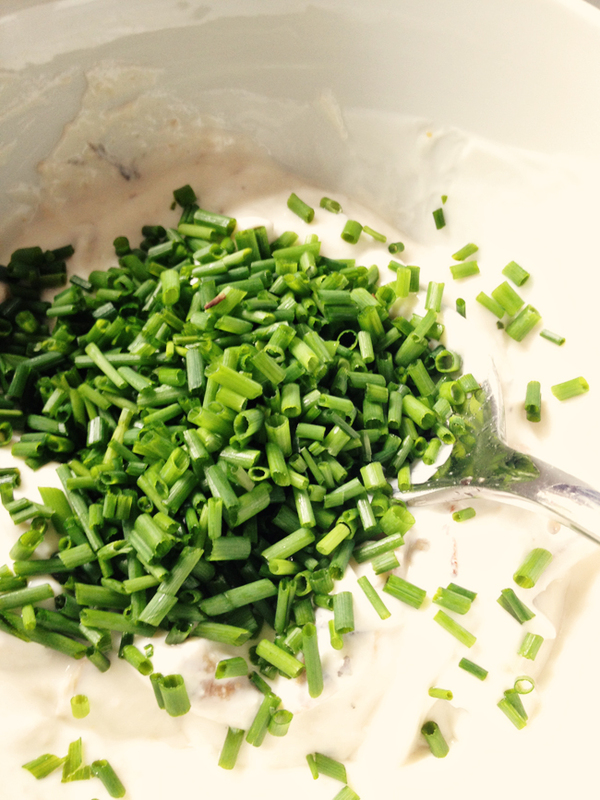 Push the two sides apart and spoon in the yoghurt/mackerel mix and sprinkle with the remaining chives. mmm love it! i promise i will try it this week! ps: we're having a painting giveaway on the blog this week - you're invited! Let me know how it goes. 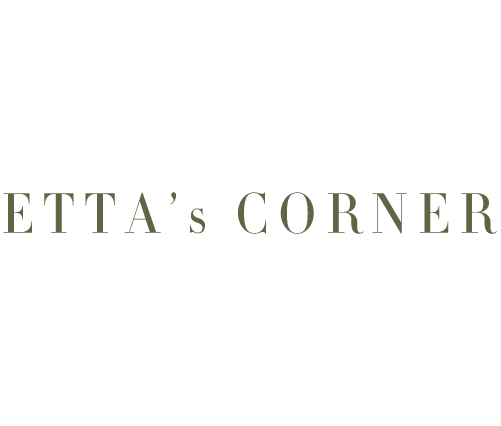 :) Will check out your giveaway after work!